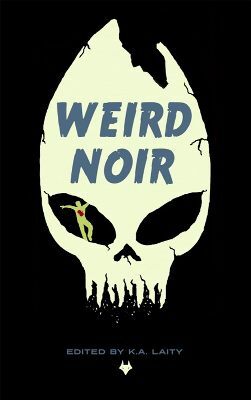 Weird Noir: coming to print! A couple of things: I was at a talk and concert by Spacedog’s Sarah Angliss in Hackney and I scribbled down the phrase, “luminiferous ether.”I didn’t have any plans for it at the time, I just like the way it rolled around in my head. I had decided I wanted to write a crime/noir novel (I blame Mr B who led me into the genre like a stranger with candy) and then I realised I had the first line. Then it started rolling and it’s just kept rolling. It’s crime, but it’s got some supernatural elements, so I guess I could maybe fit it under the weird noir umbrella. What can I say? I like the neighborhood. Tilda Swinton. She could play all the parts and it would be amazing. The love scene would be particularly interesting, so I guess I better write one. A fake psychic who might not be, a murdered trophy wife, a ruthless media mogul, a weird drug cult: it spells trouble for someone. Wow, I have to work on that hook. I’m far too lazy to self-publish so I’ll have to seek out someone to publish it. I’m sure someone will eventually. I hope. Eek. I’m still writing it. I started in August and I’m up to 27K 32K but the pace has slowed as the semester started and I got this flurry of publications (and started the novella too, like an eejit). I’d say it’s a mash up of Dashiell Hammett, Hunter S. Thompson and the lyrics of Mark E. Smith, but that would sound pretentious so I’ll just say the Dandy and the Beano. Well, the title gives away a connection to Lewis Carroll and Jefferson Airplane, but a more apt inspiration comes from the B movie Blue Sunshine, which I was obsessed with for a while years ago and can only remember the vaguest bits of now — but what I recall must matter. And the three wise men above. There’s a ginger cat! And a character inspired by my pal Chloë, so there’s some salty colorful language. I like to think it’s funny. It makes me laugh anyway. >_< But it’s also creepy and atmospheric, or I’m trying to make it so. NoirCon write up tomorrow (I hope). My idea for an art installation, ‘Don’t Hate Me Because I’m Beautiful’ is featured at Wild Violet this week. I am crazy busy and full of ideas but really short on time. In addition to the novel, there’s a novella in progress that I want done this month and there’s a short video idea and I was going to make a trailer or two as well. We shall see. I like your ‘flurry of publications’ 🙂 One of them is being hosted today. Great review! Yes, you’re responsible for a lot of that flurry, woman. Ginger cats AND Blue Sunshine! Perfect. All novels should have cats in them. Maybe that’s why I’m having such trouble with the current book – I forgot to include a cat. I can’t believe you don’t have a cat in yours! Of course you must!